We recently conducted an A/B test with Bonn-based publisher General-Anzeiger, where we changed their List Widget format to a Block Widget. Specifically, we focused on a mobile format since the user demographic for mobile devices are continuously rising as a majority. This is due to the change of content consumption among online users. 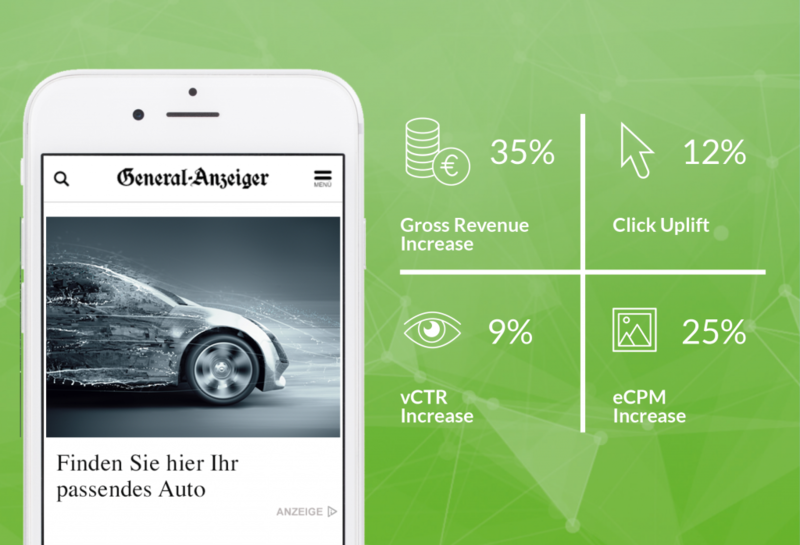 Visibility is highly crucial, so we provided General Anzeiger with a highly-visible widget to increase the widget performance in mobile. Check out our case study below. Through this A/B Testing, we found that General-Anzeiger’s performance KPIs increased. Overall, the gross revenue increased by 35% with a click uplift of 12%. The visible click-through rate also earned an increase of almost 10% while the effective cost-per-mille increased by a quarter. These KPIs are quite important in General Anzeiger’s case because these performances are particularly what spiked up this publisher’s revenue. The Block Widget’s more accessible visibility for users can potentially make it more likely that users will engage with the recommended content, which ultimately means a potential case of higher revenue for publishers such as General Anzeiger. Our case study of the A/B test shows that plista is not only constantly optimizing internally, but also externally to our clients. Clients, such as General-Anzeiger, are very important to us. As a well-rounded service provider, plista is constantly nurturing our clients. We keep track of the goals, potential, and successes through reaching the right audience. plista supports clients’ opportunities to make more revenue through constant optimization. We provide the tools and offer publishers and advertisers the best results for their content, ads, and platforms. If you have any further questions or interest in plista’s Recommendation Widget, your account manager will be happy to support. Feel free to contact us.